Kevin Willmott, screenwriter for Spike Lee’s ”Chiraq” to speak at Northwestern on April 15, 2016. Details to come. This special exhibit will run November 26, 2015 to April 17, 2016 adn feature a program of events in collaboration with the National Hellenic Museum in Chicago’s Greektown. 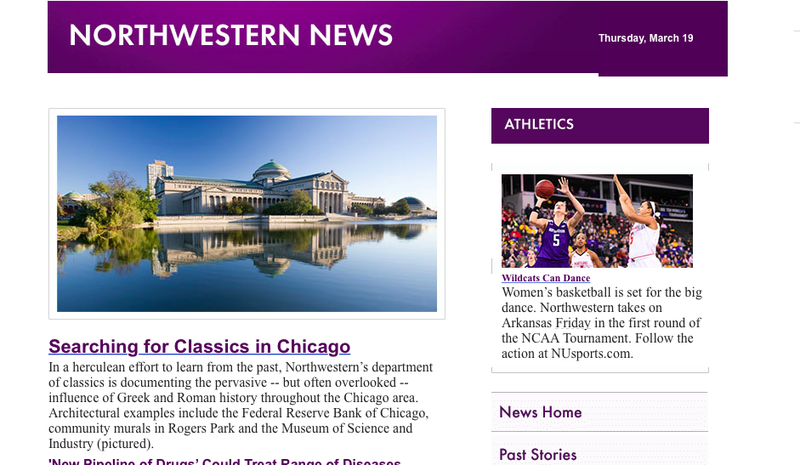 “In a herculean effort to learn from the past, Northwestern University’s department of classics is documenting the pervasive — but often overlooked — influence of Greek and Roman history throughout the Chicago area.” Read the full Northwestern News article here. It’s back for 16 performances between June 20-August 9. A 12-hour theatrical event based on the entire canon of surviving Greek tragedy. Don’t miss this epic theater event! Northwestern University’s Weinberg College of Arts and Sciences ran this feature article on the Bosher Collection and the Classicizing Chicago Project and showcased the newly launched website on the WCAS homepage. From March 1 to April 5, the Sideshow Theatre Company presents Anne Carson’s Antigonick, a free translation of Sophocles’ Antigone. The National Hellenic Museum in Chicago’s Greektown hosts the Greek Monsters exhibit, running now through May 2015. Read the Tribune write-up here.